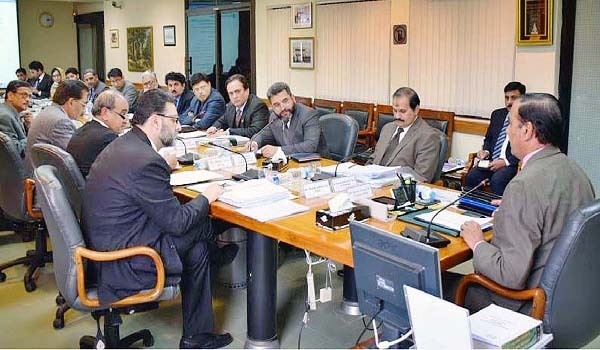 ISLAMABAD, Aug 9 (APP): The Executive Board Meeting (EBM) of National Accountability Bureau (NAB) on Tuesday decided to authorize seven inquiries against corrupt persons for causing huge loss to the national exchequer. NAB Chairman Qamar Zaman Chaudhry chaired the meeting here which authorized first inquiry against Syed Iftikhar ul Hassan, MNA, Sialkot. In this case, the accused was alleged for accumulation of assets beyond known sources of income. The second inquiry was authorized against officers of Federal Bureau of Revenue (FBR) and others who were alleged for misuse of authority in relaxing tax regime for some service providers, causing huge loss to national kitty. The third inquiry was authorized against the management of M/s Power Pack and in this case, the accused persons were alleged for willful loan default of Rs 165.37 million. The case was referred by State Bank of Pakistan under Section 31-D. Maj ® Kamran Kiyani is the sole proprietor of the firm. The fourth inquiry was authorized against officers/officials of Pakistan State Oil (PSO), Management of Admore Gas Pvt Limited (AGPL) and others. In this case, the accused were alleged for misuse of authority for illegally awarding of contract of worth billions of rupees to Admore Gas Private limited (AGPL). The fifth inquiry was authorized against management of PPL for selling a plot measuring 3510 square yard in Civil Lines Quarters, Karachi at less than market rate which caused huge loss to the national exchequer. The sixth inquiry was authorized against Ziaul Hassan Lanjar, former Advisor to Chief Minister, Sindh. In this case, the accused was alleged for accumulation of assets beyond known sources of income. The seventh inquiry was authorized against Parveen Naeem Shah, Vice Chancellor (VC) Shah Abdul Latif University, Khairpur, Sindh and others. In this case, the accused persons were alleged for Suspicious Transaction Report forwarded by FMU of State Bank of Pakistan under Section 31-D. The EBM also approved Voluntary Return (VR) application of Rs. 2.17 million by Ch. Muhammad Shahid Mehmood, contractor, in a case of inquiry against Haroon Khan, Ex-Executive Engineering, Upper Jhelum Canal, Gujrat Division, Irrigation Department and others. The meeting decided to close an inquiry against officers/officials of Capital Development Authority (CDA) Islamabad and others, inquiry against Mian Muhammad Latif (Ex-Director of Bank of Punjab), Chief Executive Officer (CEO), M/s Chenab Ltd & Group of companies, Lahore/Faisalabad and other and inquiry against Dr. Zia ur Rehman, Ex-Chief Executive, Ayub Medical Institute, Abbotabad. The EBM also closed Complaint Verification (CV) against Arbab Ghulam Rahim, Ex-Chief Minister Sindh and others due to lack of incriminating evidence. Later addressing the meeting, Qamar Zaman Chaudhry said NAB was committed to eradicating corruption by adopting zero tolerance policy through awareness, prevention and enforcement strategy. He directed all the officers of NAB to work with more dedication and ensure transparency in conduct of complaint verification, inquiries and investigations against corrupt in accordance with laid down laws/SOPs and on merit.